This entry was posted in Search Engine Optimization and tagged alexa webanalytics on April 26, 2006 by Paul Salber. 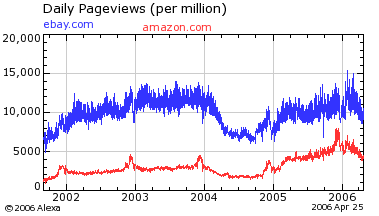 Alexa, the free traffic statistics site, has just upgraded its service. Alexa has been gathering data from users of its toolbar for many years. Yet the cumulative statistics of traffic to web sites was not available for more than two year periods. In adition to improved features, the new upgrade offers a max button that offers its entire statistics history of a site. On lower traffic sites the statistics can be distorted, and errors can be quite large depending on the alexa’s base of toolbar users. Other than that, Alexa is an excellent alternative to payed traffic statistics services like Netvalue from ACNielsen or Hitwise.